My 23 year old son asked, "Mom, what would you like to do for your 50th birthday?" "Make something very special with you," I said.." Something that we could always keep in the family as our own creation." Next thing I knew, wrapped up in tissue paper was a tub of Pre-Mixed Grout! If this information has been interesting, entertaining, and/or helpful, please remember to click the "Like" or other buttons at the top of this page to share this with your friends. We really love this end table. 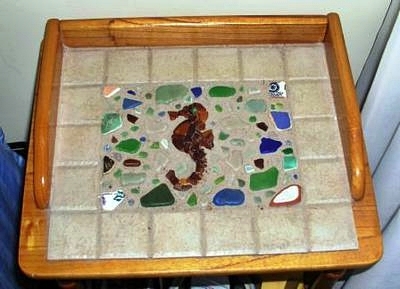 It is beautifully made with sea glass etc and really gives the feel of a beach house, cozy evening, looking forward to the early morning beach.